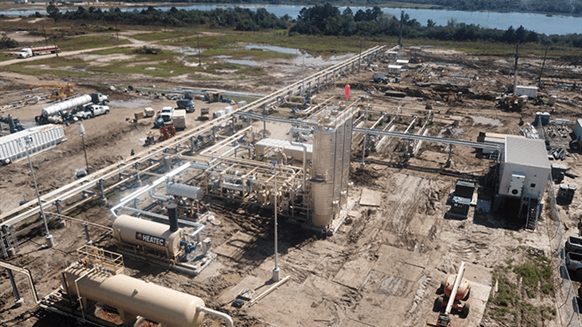 by Matthew V. Veazey | Rigzone Staff | Wednesday, March 20, 2019 (Rigzone) – The center of gravity in the U.S. Gulf Coast natural gas liquids (NGL) storage sector is shifting, according to the top executive of a firm that is helping to effect that change. In Dec. 2018 CDP began operations at the first underground storage cavern at its new Caliche Coastal facility, located near Beaumont in Texas’ “Golden Triangle” refining and petrochemicals hub. The first cavern, drilled into the Spindletop salt dome, can hold up to 5 million barrels of ethylene. Caliche has drilled two additional caverns – with capacities of 5 million and 3 million barrels, respectively – and aims to make them operational next year. CDP plans for the complex, designed to store ethylene as well as y-grade and other NGLs, to eventually boast up to 32 million barrels of capacity. Marchese recently shared with Rigzone his insights about the NGL transition underway on the Gulf Coast and how his company is distinguishing itself from storage firms down the road from Beaumont at the North American NGL hub at Mont Belvieu. Read on for his perspective. Rigzone: What are some of the major trends you’re seeing in the U.S. Gulf Coast NGL storage sector? Dave Marchese: The sector is following many of the same trends that we saw in the liquids supply chain. Debottlenecks started at the processing plants, then followed the product through pipelines and to the fractionation facilities. We view storage as the next set of assets requiring growth investments to accommodate the increase in NGLs across the U.S. Gulf Coast. Market participants recognize the need for more NGL storage capacity, but they haven’t quite figured out how to address the value proposition and long-term contracts required to develop the new assets to meet that need. Rigzone: For decades, Mont Belvieu has been the NGL storage hub. What are its limitations that motivated Caliche to develop an alternative at Beaumont? Also, why Beaumont? Dave Marchese: Mont Belvieu will always be important because of the salt formations that exist there, and also because of how much has been invested in the center’s growth. That said, the Belvieu market is facing real limitations today. Beyond the fact that the center of gravity is shifting, Mont Belvieu is becoming a congested hub. The growth in additional fractionators requires more NGL storage, and the pipeline corridors that move y-grade and purity products to/from sites are backed up and brine-handling infrastructure is getting more expensive and constrained. Beaumont has solutions for all three of these issues. Rigzone: What’s the significance of not taking title to the commodity at your facility, particularly in comparison to NGL storage at Mont Belvieu? Dave Marchese: Caliche’s market offering is important because most of the storage caverns in Mont Belvieu are owned by the fractionators who are managing their purity product positions and also marketing those products. They are also using storage to support their assets with working inventory. The owners of the caverns are ultimately in competition with their storage customers. Caliche doesn’t take title to commodity, so we don’t compete with our customers. We also believe that our pricing is at market rates when compared to Mont Belvieu or to other caverns that might be built. Rigzone: If you had to single out the main advantage your project has over Mont Belvieu, what would it be? Dave Marchese: I think it would be our project’s ownership and control of sufficient brine storage and displacement, which allows for firm receipt and delivery agreements with our customers. Rigzone: Can you give some idea of the economic and NGL market impacts that you anticipate from your project? Dave Marchese: We hope to mitigate some of the volatility in NGL products that our customers in the downstream markets currently experience. Longer-term, we’d like to see the NGL markets increase both in liquidity and price discovery. We believe the advent of disinterested third-party infrastructure will drive this change and ultimately benefit our upstream and downstream customers’ bottom line.